I love ethnic food, and I love a good deal. 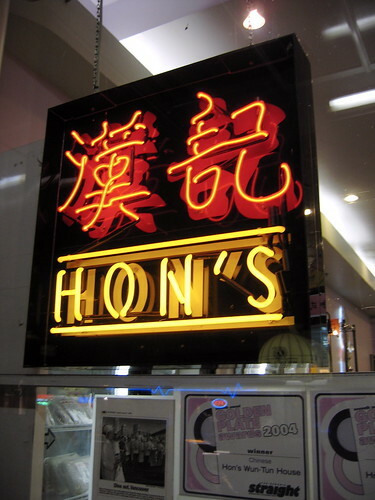 Hons Wun-Tun House on Robson provides both. You walk in to this large open concept restaurant with cooking stations all around the outside… you can’t help but be reminded of the high-school cafeteria, luckily though you don’t need to think about where the cool kids sit – they pick the seating for you. The service is far from stellar, but the food is amazing. There are multiple menus with tons of items in each. The 9 page regular menu can be found here. I can be fairly confident when I say anything would be a good choice. I have yet to try the tripe, tendon or pig feet, if anyone has some feedback on those choice items let me know. Try the hot and sour soup, bbq pork, and the potstickers. They also have a Chinese beer that they offer for under $3 a bottle, I can’t remember the name, but it is great. They do have a few other locations, but Robson is the only one I have been to. Great food, at a great price, served fast with sub-par service.